Guess we’ve been asleep at the wheel again, but we only just noticed that upscale jewelry designer Judith Ripka is now selling handbags, as well as baubles and bling, on QVC. We saw at least 15 purses on QVC.com from Ripka. They all have a classic, high-end look, and range in price from $150 to $300. Manhattanite Ripka has named each of her handbags after a neighborhood or street in the Big Apple, monikers such as Soho, Grammercy, Astor, Waverly and Sutton. Most of the reviews are pretty good. We guess Ripka is taking a page out of QVC queen Joan Rivers’ book. The comedian started out doing jewelry for the home shopping network and then branched out into items like purses and apparel. Last week we saw a very witty promo that Ellen DeGeneres did for QVC, where she tongue-in-cheek mentioned network staples like Joan Rivers’ iconic bee pins. DeGeneres sells her HALO pet food on QVC, and was telling viewers she would be back with her line this Thusday. In the on-air promo, DeGeneres says says become obsessed with QVC. Monday QVC put a press release on the blonde comedian’s return to QVC to unveil the latest additions to her holistic pet care collection. The 12-time Emmy Award winner and “ardent animal lover,” as QVC calls her, is scheduled to appear live from the set of “The Ellen DeGeneres Show” in Los Angeles at 9 p.m. to hawk products from her HALO, Purely for Pets line. 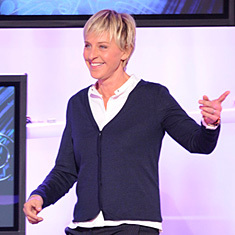 As in her promo, DeGeneres good-naturedly mocked QVC in her press release statements, too. DeGeneres’s natural line includes a variety of food choices, supplements and treats for dogs and cats, as well as a stain and odor remover kit, with prices ranging from $20 to $40. “Each product was created with the belief that good nutrition is the single most important factor in a holistic approach to wellness,” the press release says. HALO, Purely for Pets products are made with natural ingredients, including butcher-quality chicken, eggs, carrots, flaxseed, green peas, barley, sweet potatoes and cranberries, to provide pet owners with wholesome, healthy products to enhance the overall wellness of their pets. If you’re looking to find out what QVC vendor Joan Riviers’ favorite haunts are in the Big Apple, check out this “My New York” feature from the New York Post Sunday. Rivers, the subject of the frank documentary “Joan Rivers: A Piece of Work,” is a fan of the Viand Coffee Shop on Madison Avenue near 61st Street. We used to grab coffee there when we had the money to get our hair done at the OC 61 salon around the corner. Rivers says the folks at Viand know her, and she gets dark turkey meat for her dog there. FYI, QVC vendor Judith Ripka has a retail store right there, on the corner of 61st and Madison. In terms of fancier eateries, Rivers is a fan of the media mecca Michael’s on 55th Street, where entertainment types go to be seen. We’ve been to press conferences there. The scene is better than the food. Rivers also lauds Joe Allen, the Theater District restaurant. She says “real theater people” chow down there. The comedian’s other New York favorites include Times Square at night, Central Park and Brighton Beach in Brooklyn. The New York Post has a story Sunday on the return, for Season 2, of Joan Rivers’ “How’d You Get So Rich” on TV Land. We just don’t know how Rivers has the energy and the time to do her QVC line, perform, do movies and lead an active Manhattan social life – plus the TV Land show. A documentary about Rivers, “Joan Rivers — A Piece of Work,” will be in theaters June 11. It’s a frank film, and Rivers told the Post she’s a “suicide survivor” and said she is still traumatized by her husband Edgar’s suicide. “I walk past Edgar’s picture and to this day I say, ‘Go to hell,'” she said. 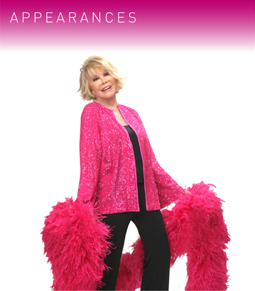 QVC’s veteran jewelry queen, Joan Rivers, made an appearence on “Celebrity Apprentice” Sunday night. And that girl never misses a chance to promote her home shopping wares. We didn’t see her, but Rivers was wearing one of her new pieces for QVC, a bib necklace that comes in either blue or biege color waves. It sells for $82, and will be on “PM Style” Monday night. You are currently browsing the archives for the Joan Rivers category.